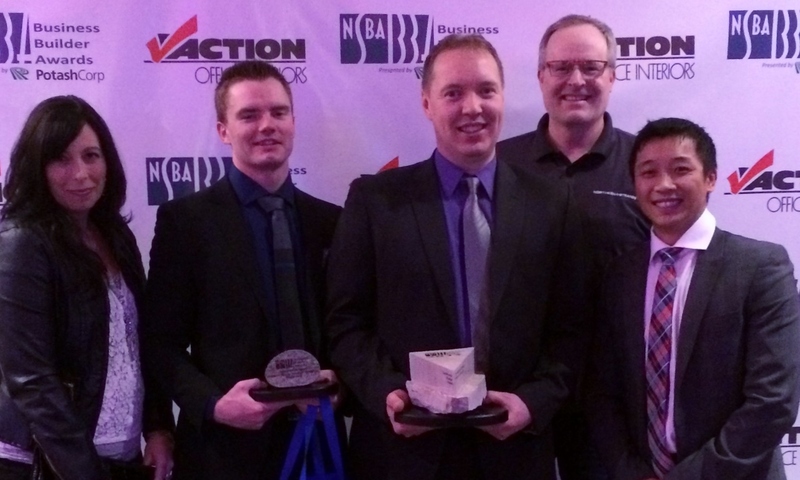 March 30th was an exciting night for employees of the Northern Strands Group of Companies. It was the NSBA Business Builder Awards and the Group of Companies was a finalist for Community Builder and Safe Employer Awards. The Children's Wish Foundation of Saskatchewan had nominated the Group of companies for the Community Builder Award and the NSBA nominated us for the Safe Employer Award. Why were we honored with the Community Builder Award you might ask? On an annual basis the Northern Strands Group of Companies gives back to the community in a variety of ways. An employee-driven Committee has been established to drive fund-raising while keeping in mind the other areas of social responsibility. Right from day one our employees are exposed to our culture of community support and social responsibility. In our new hire pack we have included a letter that explains our efforts to be an active contributor in the community. This same letter explains that we have partnered with the Saskatchewan Children's Wish foundation and have the goal of granting one child's wish annually. After reading this letter, many of our employees choose to donate through our Children's Wish payroll deduction program. This is just the start of our fundraising though. Throughout the year we raise funds for Children's Wish in a variety of ways; Paper, pop cans, containers and batteries are recycled. Additional funds are raised through yard cleanup with scrap steel and other reusable goods being sent to auction. The Group of Companies holds several fund-raising BBQ's throughout the summer. Employees are encouraged to participate and volunteer to help with the activities during the event. We contact neighboring businesses and drop off flyers in the effort to grow each and every BBQ. We also have a very unique way of giving back to the community. We use our Safety Training Ambulance to raise money at events like Craven Country Jamboree and other similar events. Our Trainers donate their time as first responders. They offer basic medical care out of the ambulance. Any money we are paid is donated back to Children's Wish. Every year our efforts have helped give hope to a local family that needed it the most. We believe one of the key reasons we are successful in encouraging our employees to donate their time is the connection we make with the child we are aligned with. Every year we make an effort to meet with our Children's Wish child and their family at a Children's Wish organized event. The last two years we participated in Children's Wish's Exile Island. A fundraising event where 8 employees take the afternoon off to compete in a series of fun events with their child. We are proud to say that for last 4 years in a row we have donated over $10,000 towards granting a Child's Wish! Although Children's Wish is our main focus, we still contribute to the community in a variety of other ways. We have sponsored or donated to many other local charities, events and teams; the Contacts, Delisle Rodeo, Saskatchewan 4H club, The Salvation Army, Saskatoon Food bank, Friendship Inn and SWITCH. We are equally proud of our NSBA Safe Employer Finalist Nomination. Safety of our employees, customers and community has and always will be the cornerstone of the Northern Strands Group of Companies. Many companies promote safety, but our company is literally built on safety. We have several divisions with a direct link to offering safe solutions to our community including safety training, fall protection systems, rigging and lifting, and suspended access. We also perform safety inspections and regularly develop safe work procedures and systems for the mining and industrial industries. We are continuously reviewing and enhancing our own safety and environmental polices. We will continue to demonstrate that our commitment to safety and environment in our community will always be our highest priority. The Northern Strands Group of Companies will continue to lead by example by supporting our local communities and being an industry leader in employee and worker safety. We would like to thank the hardworking employees of the Northern Strands Group of Companies. Our employees are the driving force behind our fundraising efforts and our safety first mentality. Northern Strands, Fortis Mining Engineering & Manufacturing and Certified Mining & Construction Sales & Rentals are all proudly Saskatoon, Saskatchewan owned and operated. Proper Rigging Techniques...Have You Ever Done This When Rigging? 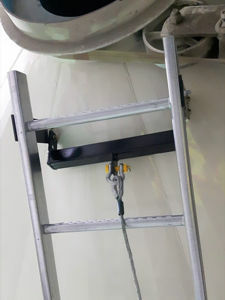 Picture this: You’re connecting a sling to a swivel hoist ring using a screw pin shackle. You get the sling nestled nice and comfy in the bow of the shackle and put the ears around the bail of the hoist ring. You insert the shackle pin through the ears of the shackle (being careful to catch the bail on the way through) and you twist it until it’s tight against the side of the shackle. You’re about to fly the load but wait, you forgot something! A supervisor told you that the pin is supposed to be backed off 1/4th of a turn! How could you have forgotten?! If you’ve ever been in this situation before, we have some news for you. The American Society of Mechanical Engineers states quite plainly in its B30.26 standard for Rigging Hardware “screw pin threads shall be fully engaged and tight, and the shoulder should be in contact with the shackle body” prior to any lift. With rigging especially, there seems to be a lot of industry practices that came about without consulting the manufacturer and this is one of the many examples we cover in our Crosby Rigging Seminars. One of our trainers goals during the training is to point out where there are no grey areas; if the manufacturer of a product has written procedures for its use and we don’t follow them then who is being negligent? 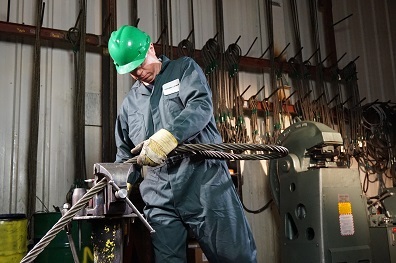 Proper rigging techniques should always be used to avoid accidents and injuries. 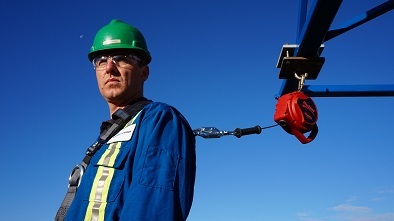 If you’re now wondering if there are any other rigging situations or practices that might not be up to par, please don’t hesitate to contact our professional Safety Trainers. We offer a variety of Safety Training courses for the mining and construction industries. We also offer Emergency Responder courses. 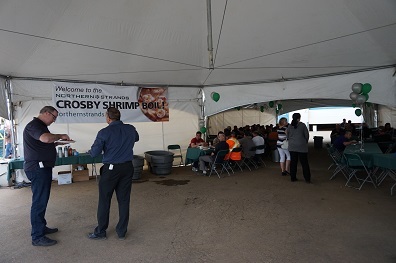 Northern Strands Crosby Shrimp Boil and Rigging Training Event a Huge Success! 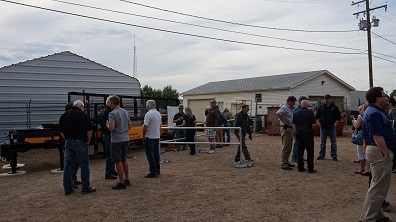 On June 1st Northern Strands hosted the Crosby Shrimp Boil and Rigging Training event. Crosby picks only 4 companies a year in North America to host this event. It took months of careful planning and teamwork to make the event a success. We started at the Travelodge for Rigging Training. We had excellent attendance for the Crosby Rigging Course. Over 80 people attend training! Crosby Group gave an excellent course on rigging. The Crosby trainer covered everything from rigging inspection to how the working load limit can vary between different types of rigging hardware. Did you know that Northern Strands offers a variety of safety training courses? i.e. Fall Arrest Training, Rigging Training, Winch Training, First Aid Training, Suspended Access Training, Wirelock Socketing Training, Emergency Medical Responder Training, Medical First Responder Training, Intermediate First Aid Training and more. After training, we all headed over to Northern Strands for the second half of our event. The Crosby Shrimp Boil! This is the part everyone was waiting for. The meal consisted of sausage, peppers, corn, mushrooms, baby potatoes and of course shrimp. See the attached PDF for the full recipe. 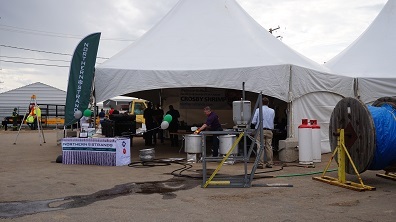 At the Shrimp Boil we provided demonstrations on Northern Strands new Mobile Test Center. We pulled rigging to destruction and showed how damaged rigging will readily break below the working load limit. 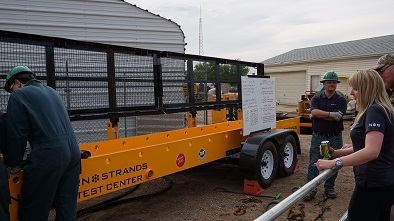 Our new Mobile Test Center was engineered and fabricated for Northern Strands by our sister company Fortis Mining Engineering & Manufacturing. Northern Strands is now offering free, "Is Your Rigging Safe Demonstration's" to qualified customers. We will bring our Mobile Test Center on site for your demonstration. See the attached brochure for detail on how to book your rigging safety demonstration. In addition to the pull to destruction demonstrations, we offered tours of our Northern Strands rigging warehouse facilities. We had employees giving demonstrations on how we fabricate 1" wire rope slings in our sling bay. Northern Strands would like to thank all of our clients that attended the Northern strands Shrimp Boil and Training Event. We hope you all enjoyed the training, dinner, pull testing demonstrations and tours of our rigging warehouse. Here are a few more great pictures from the Northern Strands Crosby Shrimp Boil!